The perfect portable speaker to carry with you on holiday, on work trips or pretty much wherever you may go. Superb sound quality, great design and quality build and the fact that the Soundbook remembers up to 4 different Bluetooth pairings means this mini speaker will soon become friendly with any laptops, tablets and smartphones you use to listen to music. There is a healthy and growing market for quality, well-built, sub-£200 portable audio systems built to appeal to the growing hordes of digital audiophiles out there. And with an increasing array of options on offer, it's easy for the discerning listener to be slightly baffled by choice, what with the likes of the £130 Jawbone Jambox, the £169 Beats Pill and the £179 Geneva XS all doing decent business. So it's interesting to see yet another contender arrive in this crowded marketplace in the shape of the £150 Bayan Audio Soundbook. But is it any good? And can a relatively unknown British audio designer compete with the big boy brands? If you are a seasoned hi-fi buff, then you might initially consider opting for a decent wireless portable systems from a trusted, well-known brand such as the recently launched £170 Bose Soundlink Mini or the £100 Cambridge Audio Minx Go or even the (slightly larger, considerably pricier) £329 Cambridge Audio Minx Air 100. But before you do that we highly recommend putting the Bayan Audio Soundbook through its paces with a thorough listening test before parting with your hard-earned. If you really care enough about music, then you want the sound quality of the tunes you are listening to on iTunes on your iPad (or streaming via Spotify on your smartphone or playing FLAC files on VLC your laptop or whatnot) to sound as good as they possibly can in situations where you can to listen to a loudspeaker instead of earbuds or over-ear cans. This generally means, in our extensive testing, that you can discount pretty much any portable speaker or iPod dock under the £100 mark, as more or less all of these will sound tiresomely over-tinny or, even at medium levels of volume, horribly distorted. Plus, the cheap plastic designs of most of these items should really mean that anybody who actuallycares about music files them away in their brain as little more than "instant landfill". What Bayan Audio (currently) lacks in the brand-awareness stakes, it makes up for in quality sound tech design. This small British audio company has already been making something of a (pleasant) noise amongst clued-up digital music fans, firstly with the release of the remarkably loud, clear and curious-looking Bayan Audio 7 speaker dock last year. And more recently with their handy StreamPort Universal NFC-friendly Bluetooth streaming box. So how does Bayan fare out there in the wilds of the busy portable speaker bazaar? Short answer? Pretty damn well. If you want something small enough to pack in your hand luggage, yet well-built and hefty enough to pump out decent-quality audio streamed wirelessly via high quality aptX encoded audio over Bluetooth 4.0 – from your tablet, smartphone, laptop or pretty much any Bluetooth-enabled device where you store your tunes (or play your streaming apps) – then the Bayan Audio Soundbook is something of a minor godsend. For two important reasons. Firstly, most other portable systems in this price-bracket simply cannot compete on sound quality when put head-to-head against the Soundbook. That's the most important point. Secondly, it looks great, feels reassuringly solid and remembers pairings with up to four different phones, tablets or computers. Oh okay. That was five reasons. The clever design,more on which below, is mainly based around cramming as much quality speaker tech into the smallest box possible, while remaining elegant, unobtrusive and pleasing to the eye. This accounts for the surprisingly weighty feel of the (558g) Soundbook. You could, should you wanted to, take it out of your bag and use it as an effective weapon to whack a mugger in the face. We don't recommend you use it in that way. The point being, it's surprisingly heavy for a speaker of its size, which is no point of criticism, for this is clearly a requirement for Bayan's audio designers to achieve the excellent sound quality the Soundbook is capable of. 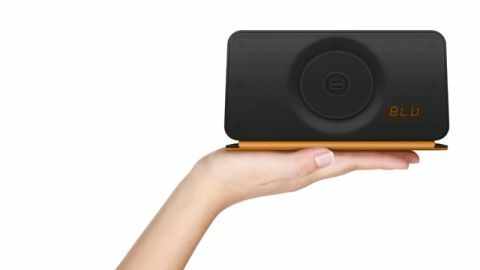 We've tested the Soundbook in pretty much every situation we can imagine having a requirement for a decent portable wireless speaker. Inside in the office, in the kitchen, in the bedroom and in large hotel suites. And outside on the beach, in the garden and around the campfire. In almost every situation one of our compatriots has commented on the impressive sound of the music. Even when our tunes weren't particularly to their taste. (Sorry, Eminem!). The Soundbook is, unsurprisingly, taking its name into account, around the size and weight of a large hardback novel, so there's really no problem carting it around with you wherever you go. Unless you are extremely weak. The Soundbook is available in two colour options – silver/turquoise and charcoal/burnt orange – and unfolding the protective mesh lid switches the system on, with the tough lid also doubling up as a stand. Really nice design touches. The rechargeable battery seems to last a good 10 hours or so in our testing. Not bad. Unless you plan to be away from a power point in the desert for days on end. In which case, having a suitable wireless iPod speaker is most likely the least of your worries. One word of minor caution here. If you are after a portable system to blast out loud hip-hop or heavy metal at a banging house party or to power a mini-rave on the beach till dawn, the Bayan Soundbook is not the portable wireless speaker you were looking for. Clearly, physics has its limitations (something even the digital audio gurus at Bayan cannot change) and you are going to need to invest in a muchbigger, louder and beefier boom-box affair if that's what you're after. Bayan has squeezed the best sound they can out of this mini marvel, taking into account the physical limitations of the Soundbook's 1-inch internal speakers, and 2-inch passive bass radiator. The treble and mid-range is clear, clean and just lovely to listen to, which makes the Soundbook the ideal portable speaker accompaniment if you are a fan of jazz, folk or acoustic music. This is not to rule out bassier and beefier hip-hop and rock, however, as the bass sound is perfectly fine for smaller outdoor gatherings and indoor listening. Just not beefy enough to rock a party! All of that said, the Soundbook does pretty much any genre of music justice. In pretty much any situation, indoors or out (that isn't a packed house party or impromptu illegal rave) its diminutive size belies its capability to do justice to the quietest guitar strumming through to the gutsiest heavy rock. If you have a smartphone or tablet with near field communication (NFC) tech then you will also benefit from the rapid auto-connect feature on the Bayan Soundbook. A far more interesting use for NFC than paying for your groceries at Tescos. Plus, the Soundbook's TDMA noise rejection ensures that you don't have any annoying interference from other electrical equipment and wireless gadgetry nearby. Which means that once you get a Bluetooth phone, tablet or laptop connected to the Soundbook, which is a pretty painless experience, the sound is consistent with no annoying drop-offs. One pretty cool additional feature of the Soundbook is the fact that it has a microphone, which means that it can easily double up as a speakerphone for laptop, phone or tablet-based Skype conference calls. Hardly a deal breaker, no, but a really nice "value add" nonetheless. Finally, for fans of older tech (read: those that don't yet own Bluetooth or NFC-enabled digital music playing smartphones and tablets) you can still rely on the good old-fashioned 3.5mm audio jack to wire your old iPod or MP3 player into the Soundbook. Or you might well just choose to tune-in to the in-built FM radio and do away with extraneous music players and other devices altogether. Our experience of listening to the cricket in the park this summer was most certainly improved by hearing the broadcast clearly and crisply through the trusty Bayan Soundbook.